Not only have cameras gotten smaller and more portable, they have also in some cases become wearable. iON Camera has joined that small group with the new SnapCam, a wearable social imaging camera that can act as an extension of your smartphone. iON is no stranger to small POV action cams and has, over the last couple of years, competed with the likes of Contour and GoPro with its Ion Air Pro series of sports camcorders. But the SnapCam is new territory for the company. With its 1.5-inch square form factor and weighing a little more than an ounce, this little cam connects wirelessly to your smartphone, facilitating shooting and sharing of HD videos, 8MP photos or live-stream video. SnapCam attaches to clothing, sporting gear or backpacks with either a clip or magnet, offering greater flexibility than popular action cameras housed in plastic cases, like the Polaroid Cube, for example. Equipped with both Wi-Fi and Bluetooth, the SnapCam wirelessly connects to a smartphone so videos and photos can be uploaded and shared on the spot. If this all sounds kind of familiar, it’s because the idea of a tiny wearable shooter, while not new, may be starting to catch on with certain kinds of photographers. Narrative, for example, just released details of the second iteration of its Clip camera, which has comparable specs to the SnapCam and features wireless connectivity. SnapCam is designed to be super-responsive, and ready for shooting with a swipe of the finger. A single tap captures an 8MP image; a double tap starts high-definition video recording at 720p and 30fps; three taps activates live video streaming. Tapping the camera once stops it from shooting. Output is saved to the micro-SD card of up to 32GB or to your smart device via Bluetooth or Wi-Fi. iON says that SnapCam can shoot 5,000 photos in time-lapse mode, record two hours of video, or shoot one hour of live streaming on a single charge — all with seven-day standby time. You can save and upload videos and photos to the cloud or share them via Facebook or Instagram. The SnapCam has a brushed metal body and comes in gunmetal grey, black or white and can be customized with colored bumpers. 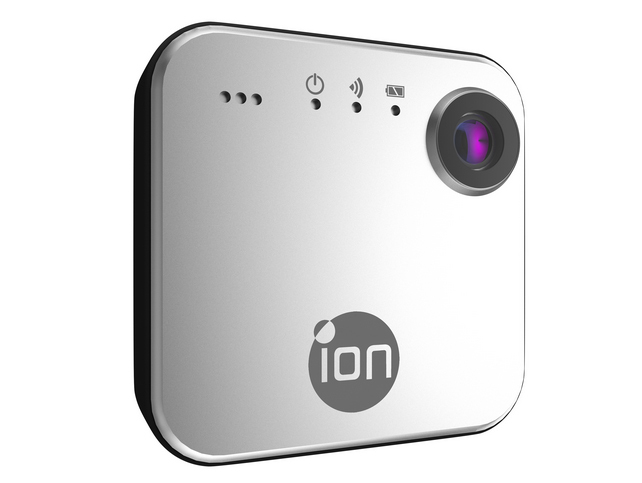 In addition, iON is also releasing the SnapCam Lite, which offers similar features but without wireless connectivity. SnapCam will sell for $149.99.while the lite version will cost $79.99. Both cameras will be available in the second quarter of 2015.